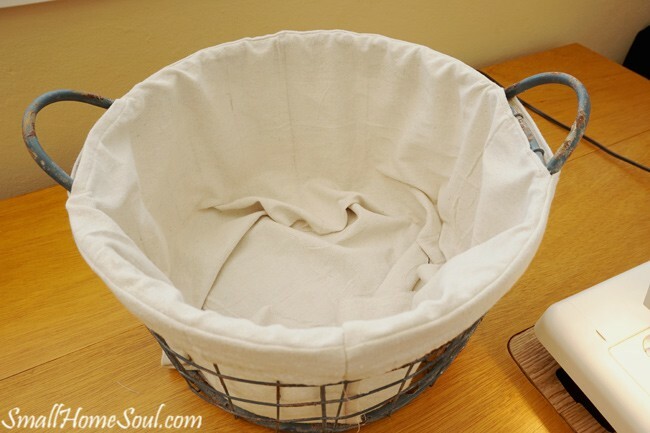 DIY Drop Cloth Basket Liner without a Pattern - Girl, Just DIY! 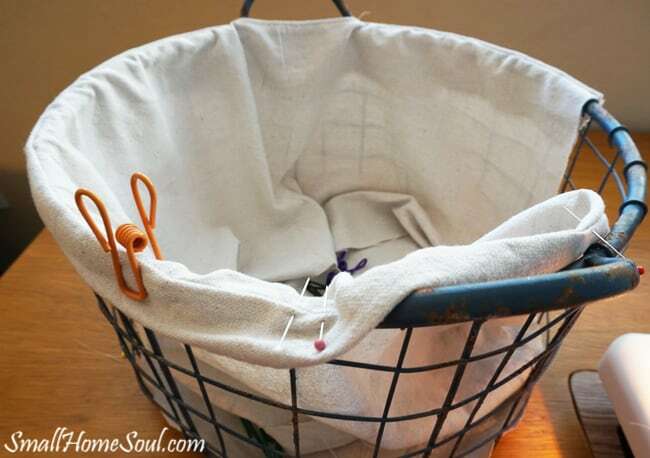 Today I’m going to show you how I made a DIY drop cloth basket liner without a pattern. It sounds hard but I’ll show you that it’s not as tough as you might think. I’ve mentioned before that I’m a member of a few blogging groups on Facebook and every once in a while they’ll have a challenge. The challenge is to make something out of a particular item. People are so creative, it’s amazing the projects that get linked up. This month challenge is drop cloths and I knew just what I was going to make. 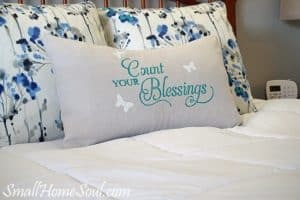 If you recall my blogging tribe and I also did a similar challenge a few months ago where I made Stenciled Drop Cloth Pillow Cover, I still love this pillow! For my project I am using something I bought last year. 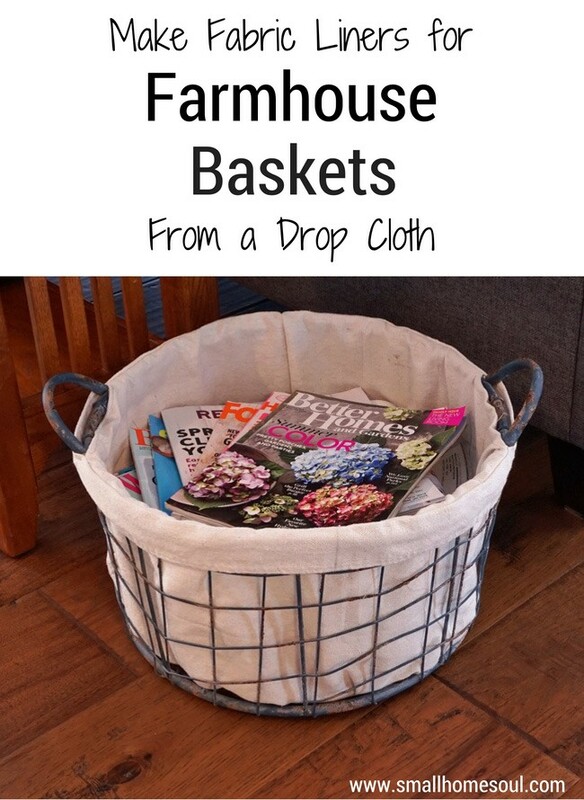 I scored this cute Farmhouse Basket for $5 off a Facebook buy/sell Group. It’s blue with chipped paint and rust spots and looks great up close but it just looked sad sitting against the dark floor and sofa. I put protective felt on the bottom so it wouldn’t scratch the floor which doesn’t help how it looks when it’s empty. Last winter I had lap blankets and throws stuffed into the basket for easy access when it was chilly. It still didn’t help it look as good as I knew it could. Then this challenge came along and I knew it was going to look great very soon. 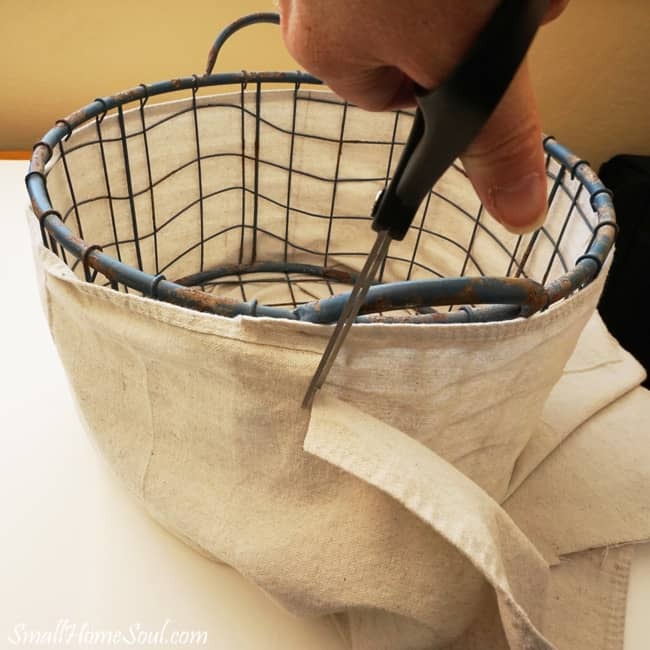 Your basket will likely be a different size so I won’t share exact dimension in this tutorial just the steps I took to make the drop cloth basket liner for my basket. My basket also has handles and you might be able to skip those specific steps if yours doesn’t. I had drop cloth material left over from my stenciled pillow so I got it out and got busy making the drop cloth basket liner. Thankfully there was a long edge that was already hemmed so that would be my top edge, saving me some sewing. 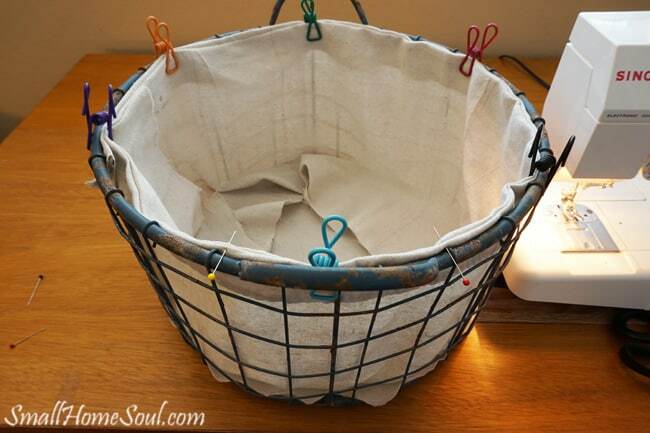 I wrapped the stitched edge of the drop cloth around the basket and over estimated how much I’d need. I marked my cut with a little snip of scissors on the top edge. I laid out the drop cloth and cut down from the mark I made with my scissors. My basket is less than 9″ tall but I estimated long just in case. I cut this piece of the drop cloth basket liner to approximately 12″ tall by the width I had just measured around the basket. Next I measured for the bottom piece. Using a marker I drew a line around the outer edge. This should give me a 5/8″ seam when attaching it to the side of the drop cloth basket liner. After those two pieces were cut it was time to start figuring out my plan. I wanted about a 1.5″ overhang and knowing I had to deal with the handles I folded over the top edge and stitched down 5/8″ This would help me deal with the handles. 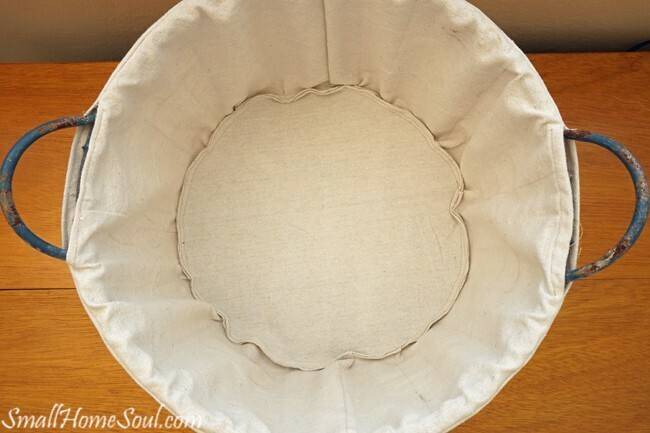 After I stitched the top section I turned it back down and clipped the drop cloth basket liner to the sides of the basket arranging the two end pieces on the side. I then marked the first handle with pins on either side. I left a little extra space on either side since the handles are thick. I planned to to create a hole in seam so the edge could slip over the handle. Sort of like a button hole. You can see in the picture below how that works. Once I’d marked the location of the first handle I used the sewing machine to make several reverse stitches at the pin marks. 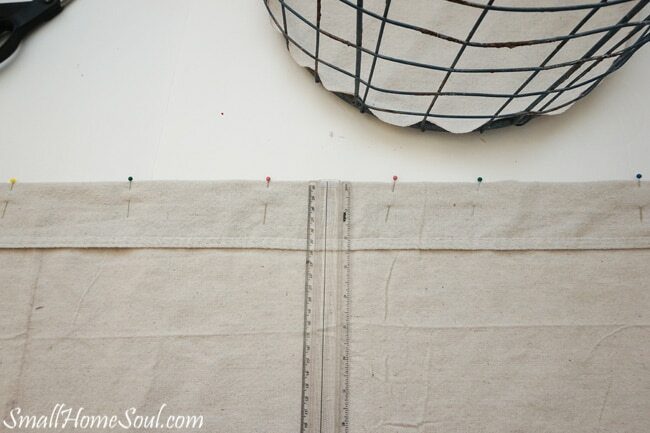 I used the seam ripper to remove the stitching between the two reverse stitches. I carefully clipped the drop cloth down to just inside of both reverse stitches (be careful not to cut into your reverse stitching. I slipped the scissors into the slot and cut the edge of the drop cloth. 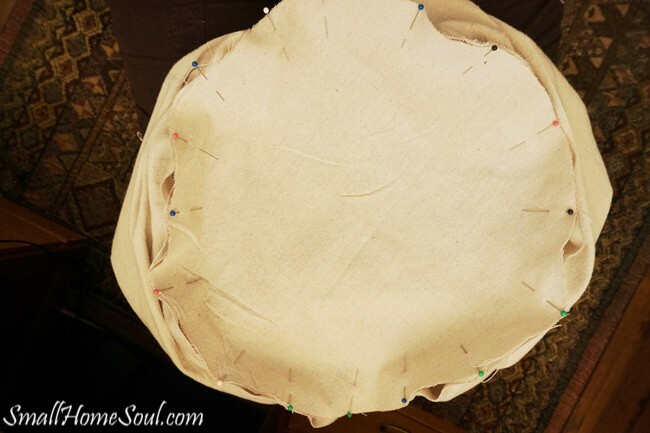 I rolled each side down twice and pinned it before stitching each side. 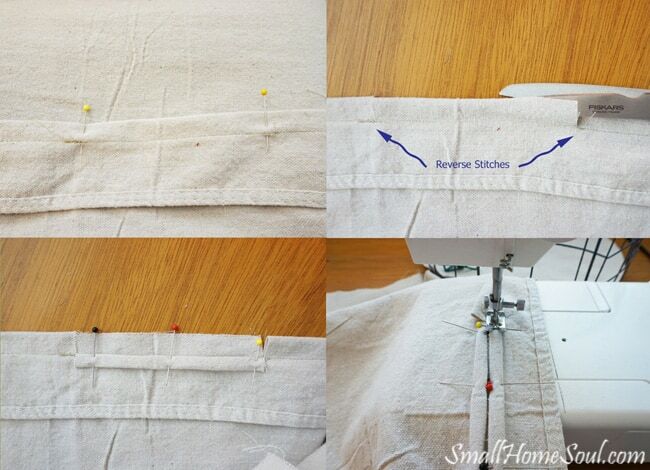 Wah lah, that’s how you make a button hole in fabric. Yay, it fit! Estimating the second handle was a bit trickier but I left a little extra space just to be sure. I figured the drop cloth basket liner could be a little baggy as long as my handles were good. Once I had the second handle marked I repeated the steps from the first handle. 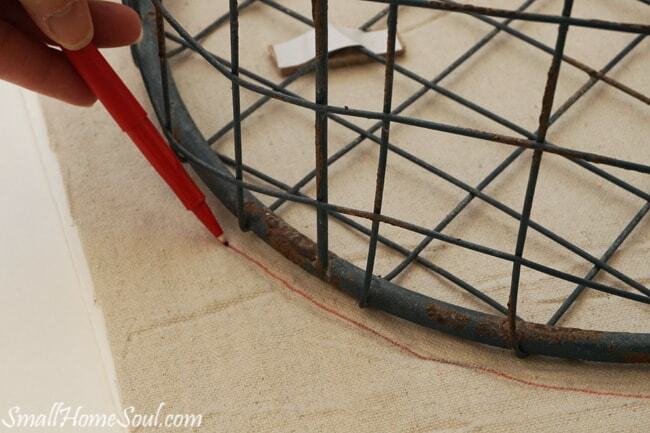 After the holes for both handles were completed I put it back onto the basket and marked where to stitch the side seam. Attaching the bottom to the sides of the drop cloth basket liner was next. With the drop cloth basket liner in place I marked the bottom inside edge with a pin. Using that pin as my guide I added 5/8″ for my seam allowance and cut off the excess from the sides. I wanted the seam to be on the inside of the basket so I put the right sides of the side piece and bottom together and started to pin. Unfortunately I forgot to account for the sides of my basket having a slight slope. That meant I had more side material than the circumference of the bottom piece. After a few tries I finally just found the middle edge of each and pinned first one side then the other. I turned it a quarter turn and pinned those two opposite sides. I kept turning and pinning, kind of how you cut a pizza. This allowed me to pin with out having huge gaps. To get rid of the excess I made tiny pleats while I was sewing. You can see a few gaps in the picture below but once stitched and on the inside you’ll never see them. Even though the seams will be on the inside I don’t want it to fray. 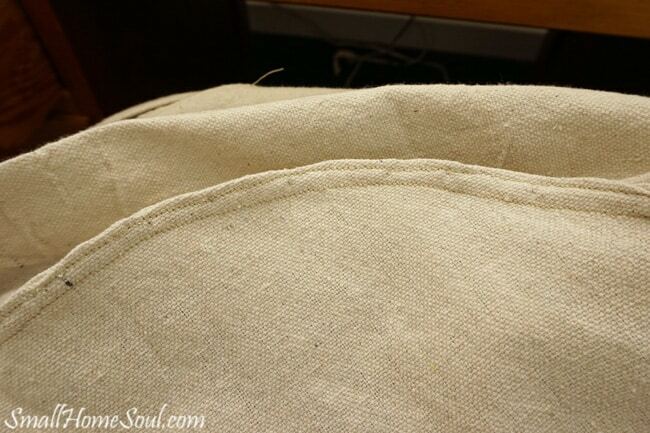 I turned under each side of the seam and then ran another line of stitching around the outside. All done, I think it turned out great considering I made this drop cloth basket liner without a pattern. And that’s how you make a DIY drop cloth basket liner without a pattern. 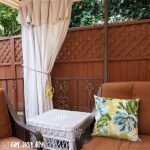 It wasn’t too hard and I hope if you need a drop cloth basket liner that this project encourages you to try one yourself. 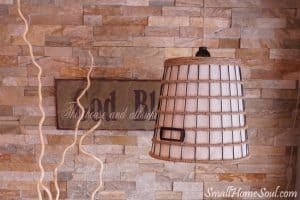 If you want to see more of the drop cloth challenge projects click over to The Shabby Creek Cottage. Until next time and don’t forget to pin! I really like what you did with the basket! I am hoping to find a basket just about like is one so can make t into a lighting fixture! I am in love with this! It gives that basket even more character than it already had (if that is possible!) What a great tutorial too. Thanks so much for this! Thank you Heather, you are so welcome. 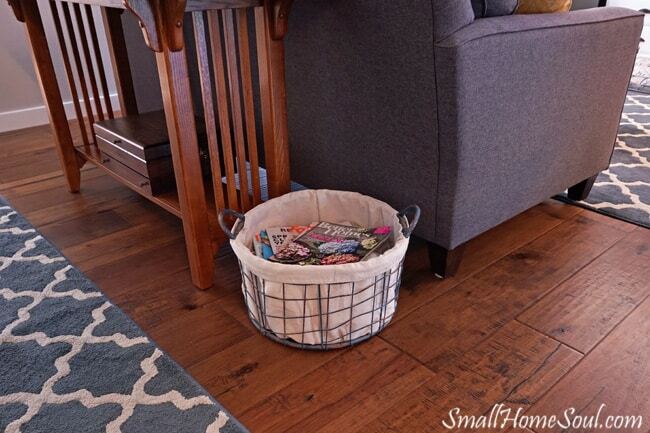 That basket is no longer invisible when it’s empty, and the contents really stand out now! It turned out perfect!! What an awesome project!! Baskets are the best invention ever! Basket Liners are the best! 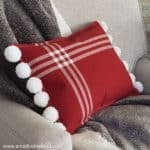 Nothing falls out.. and a DIY version is even better! Thanks for sharing at You’re Gonna Love It! Pinning! Thanks Susie, and I love your heart and your support! I love making things without a pattern! Yes Ann, lots of trial and error involved but it reminds me of the expression, “necessity is the mother of invention.” Sometimes when we want it we have no choice but to make it ourselves. What a great project! It turned out perfect! 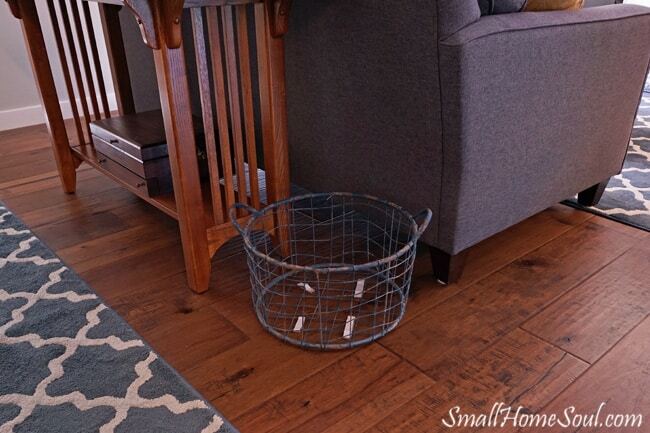 I love how it finishes off your wire basket! 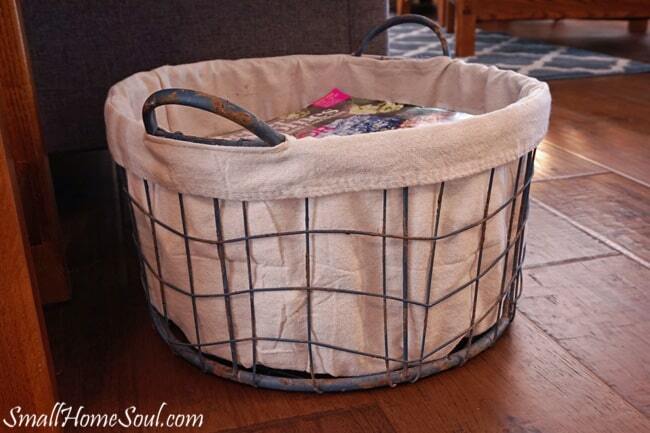 Toni, this basket liner turned out great and really shows off the basket detail. Love it. Thank you Denise, having a background helps the blue and rusty spots stand out so much better. It doesn’t look like an afterthought anymore. I love this project!! What a great idea! you are so creative! I love how your basket turned out Toni! I just love using drop cloth in projects and you’ve just added another “to do” to my drop cloth list! Yes, Sam, go make that basket liner! I hope my tutorial is easy to follow. There are a few things I’d do differently but for my first try I’m very pleased. I love how the liner turned out. What a difference it made to the basket. It really stands out. Thanks Debra, the basket no longer gets lost on the floor.